There have been a few ventures out into the damp November countryside this week. 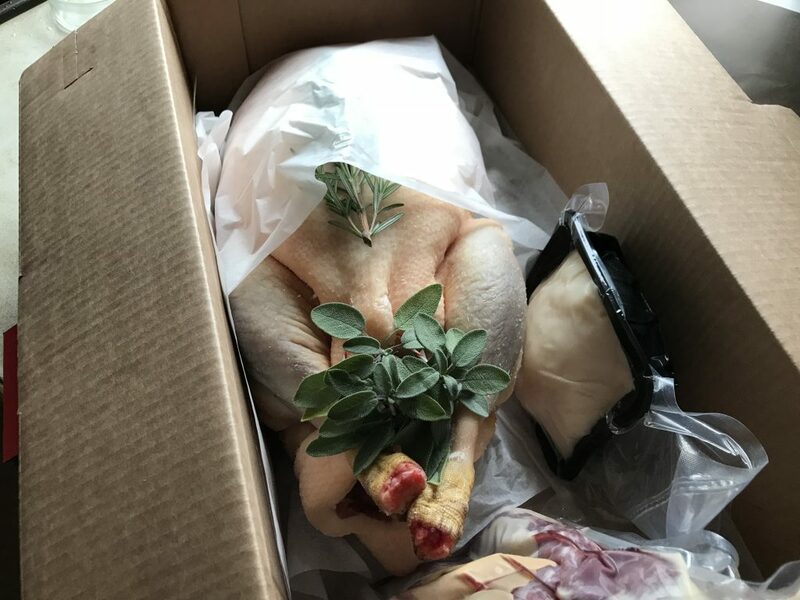 Thinking ahead, I’ve caught my Christmas goose early to take advantage of early-bird (excuse the pun) prices. 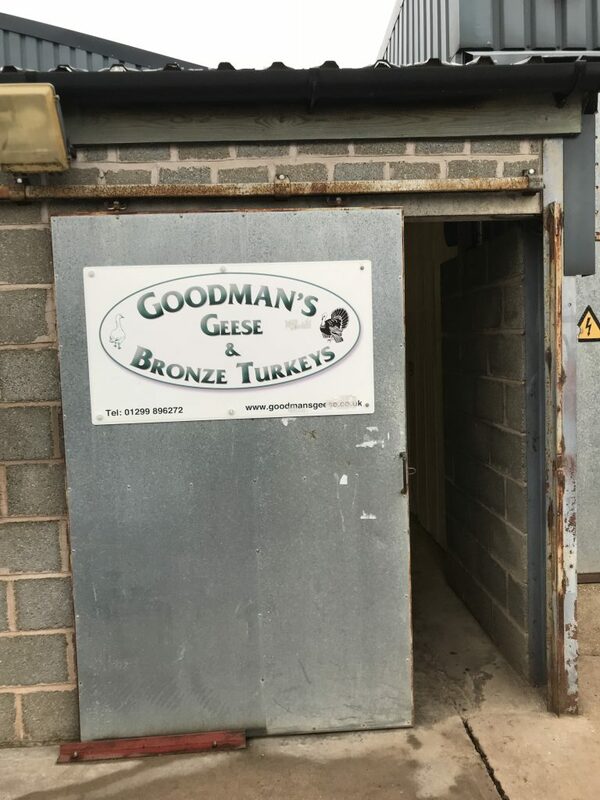 Mrs Goodman breeds the best free-range Christmas poultry, and if you collect direct from her Great Witley farm then you save ££. 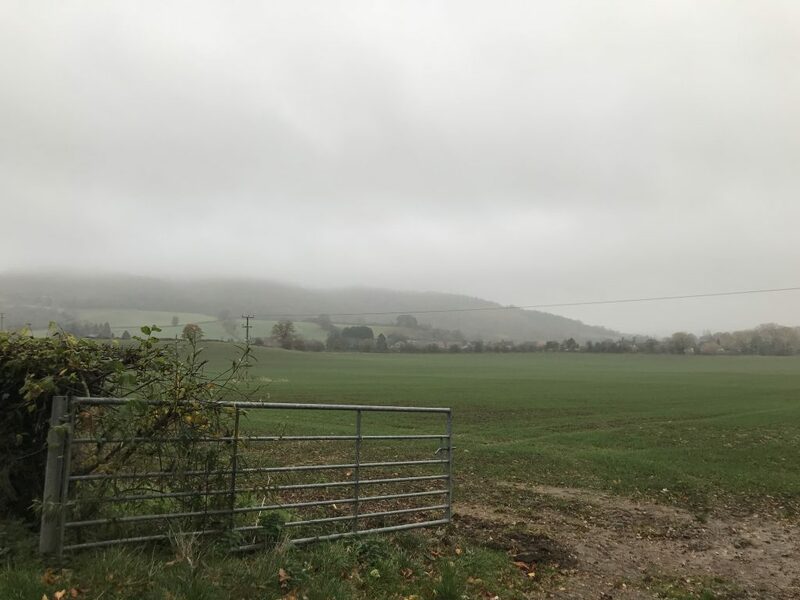 I forget how glorious the countryside is around this part of Worcestershire; even on a dim, damp late-autumn morning it was beautiful. Then Saturday took us to Baddesley Clinton, for some lunch and fresh air after a photoshoot in Coventry. 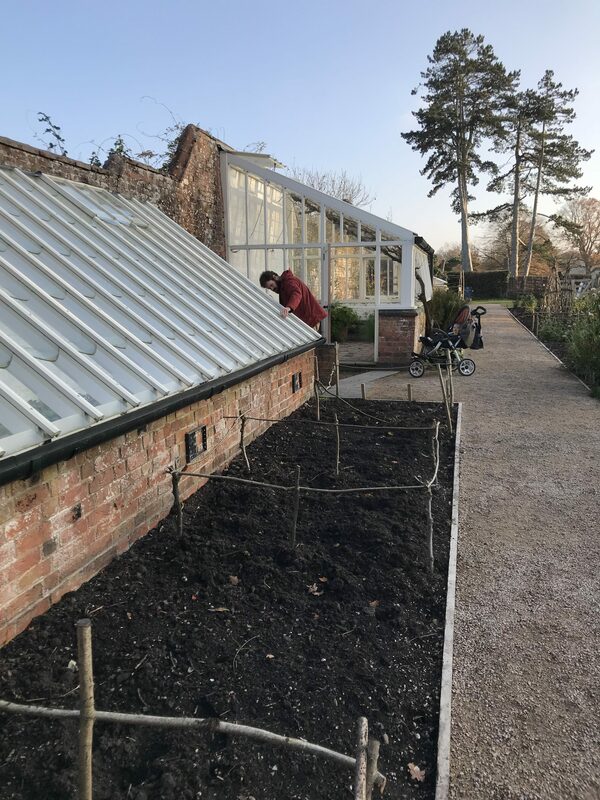 The National Trust have reconfigured the vegetable garden there and I now have envy for straight edging, compacted gravel paths and lean-to greenhouses. To today’s recipe. I’ve only been to the Netherlands twice, but both times I’ve been blown away by the brilliance of appeltaart, or Dutch apple pie. This one I had at Amsterdam’s Rijks Museum – I know I should be more interested in the art at this great establishment but pffff, baking wins every time. Appeltaart is a deep dish apple pie with a buttery biscuit-like crust, filled with apple slices or chunks that cook together with sugar and spice to make a creamy-yet-textured filling. Appeltaart is always served in generous wedges, cold or at room temperature, with a dollop of whipped cream (slagroom, in Dutch). It’s earth shatteringly good and a thing of beauty. I have wanted to have a go at making one for some time, but felt daunted at the challenge. All the recipes that I could find are either in Dutch (my languages aren’t great) or American, which requires translation from their mad cups measurement system into grams or ounces. Plus any baking this beautiful MUST be really hard…there was the certainty that I’d mess it up somehow. 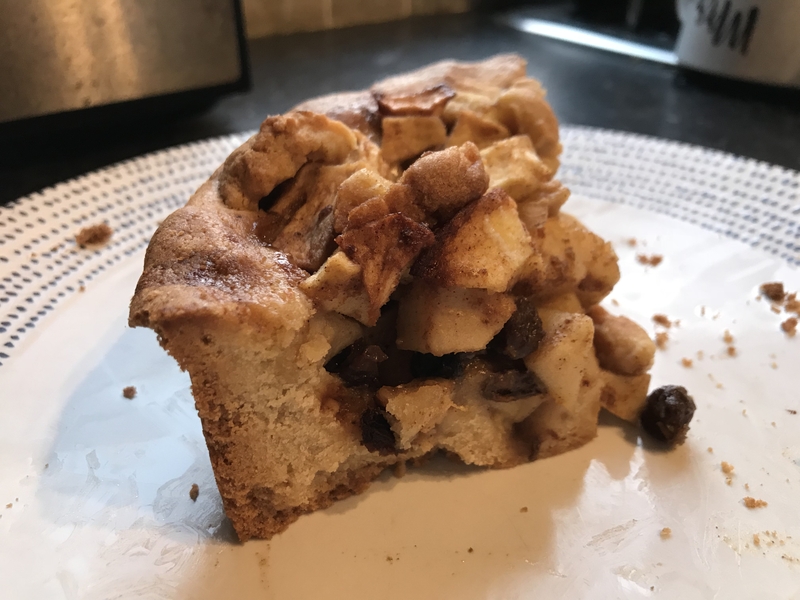 Then I found this brilliant blog post by a Canadian food writer with a step-by-step method to making appeltaart and I thought actually, perhaps I need to woman up and give it a go. I have translated Food Nouveu’s cup measurements into grams, and also reduced the quantity as I could not face eating apple pie for the next two months. The resulting recipe is good but still needs tweaking – let’s call it a work in progress. Appeltaart is made with a crust that you press into the tin with your fingers, which is actually loads easier than rolling out shortcrust. 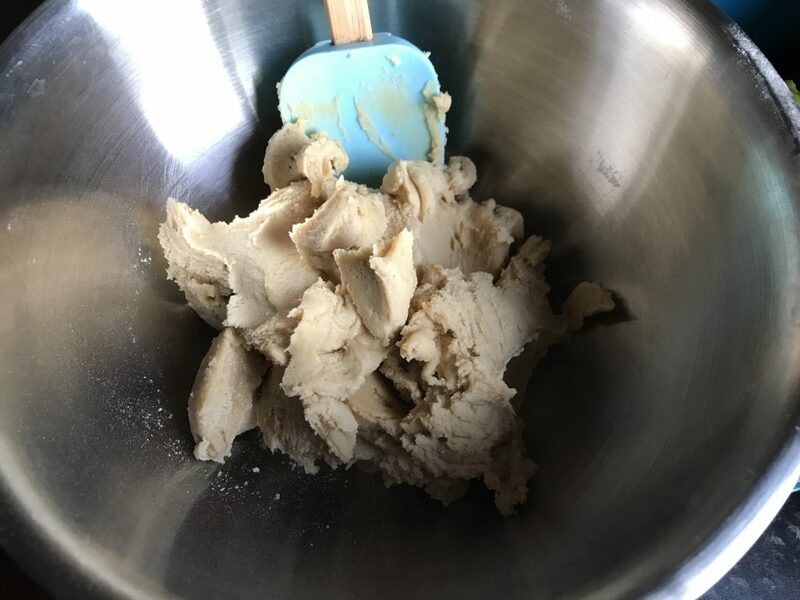 In a food processor, pulse together butter, brown sugar, salt, eggs and flour until the mixture looks like play dough, then leave it to firm up in the fridge for half an hour or so. Then press the dough into your pie dish with your fingers. You need to make it even all the way around – it may help to wet your fingers so that they don’t stick to the dough. I used a pie dish with a removable base but a spring-form cake-tin would also work well. The filling is simple enough. Apples, obviously. You need to choose your fruit wisely, with a mixture of acidic cookers and firm eaters so that when they cook you get both softness and texture. I used a mixture of bramleys and anonymous eating apples. Chop or slice them up and mix with orange zest, lemon zest, lemon juice, brown sugar, mixed spice (or cinnamon and ginger), cornflour, raisins and a slug of brandy. Pile the fruit into your crust evenly, then top with any remaining dough. I made my crust too thick so had very little dough left to make a topping, but if you have more you could make a lattice or even a full pie-top. The appeltaart is baked for what feels like an eternity (about 1 1/4 hours) and then left to cool completely before serving with whipped cream. I kept forgetting to photograph the final result, hence this awful picture of the final slice of tart! 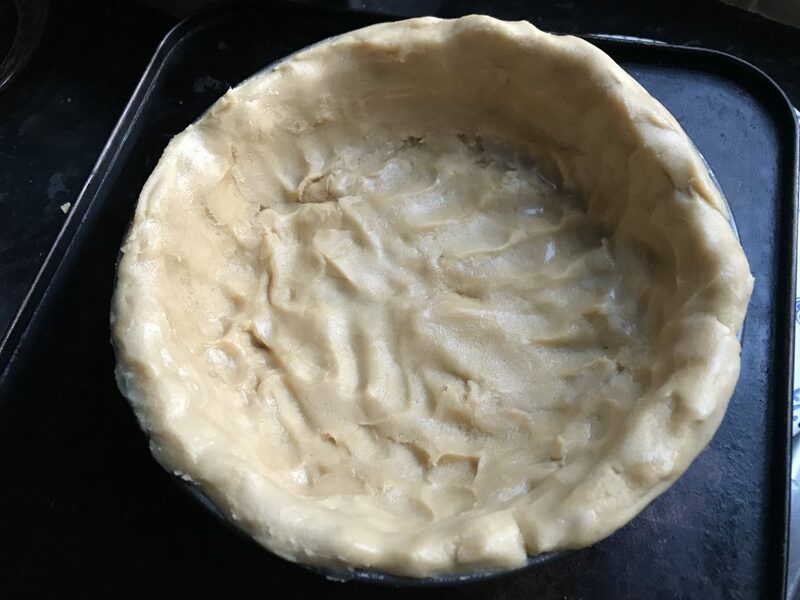 The flavours were great but the execution needs work – I think I need a pie dish with a smaller diameter to make for a deeper pie, then I can go thinner on the crust. I might also be tempted to slice rather than dice the apples, so they cook more evenly. But that aside: this is a great apple pie and a useful recipe to have up one’s sleeve for when a trip to Amsterdam is impossible. First make the crust. In a food processor, pulse the butter and sugar until creamy. Add the egg and the flour in batches, scraping down the sides to make sure everything is combined. Add the salt and pulse again. The dough will first come together in a scraggy way but eventually becomes smooth and firm, like play dough. Transfer to a bowl and chill whilst you make your filling. 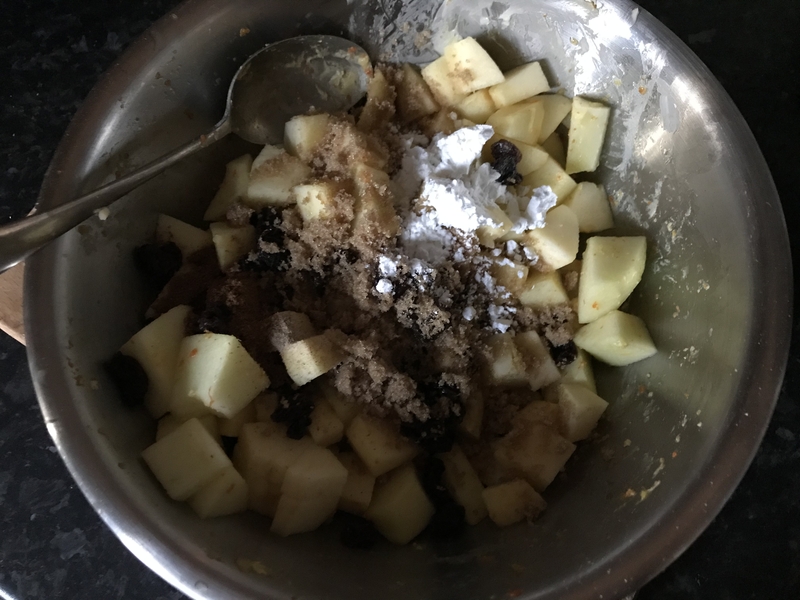 Make the filling: Slice or dice the apples and mix together with the citrus zest, juice, sugar, spice, cornflour, brandy and raisins. Make the pie: Pre-heat the oven to 190c. Grease your tin well (you can choose to line the base with baking parchment if you prefer). Press about half of the crust mixture into the base of the tin, keeping it as even as possible. It may help to dampen your fingers for this. Then take lumps of the remaining dough to line the edges of the tin, ensuring there are no gaps or holes anywhere. Pile the apples into the dish, then dot any remaining crust mixture onto the apple surface. Place the tin onto a baking sheet to catch any juices that leak out, then bake at 190c for 30 minutes. 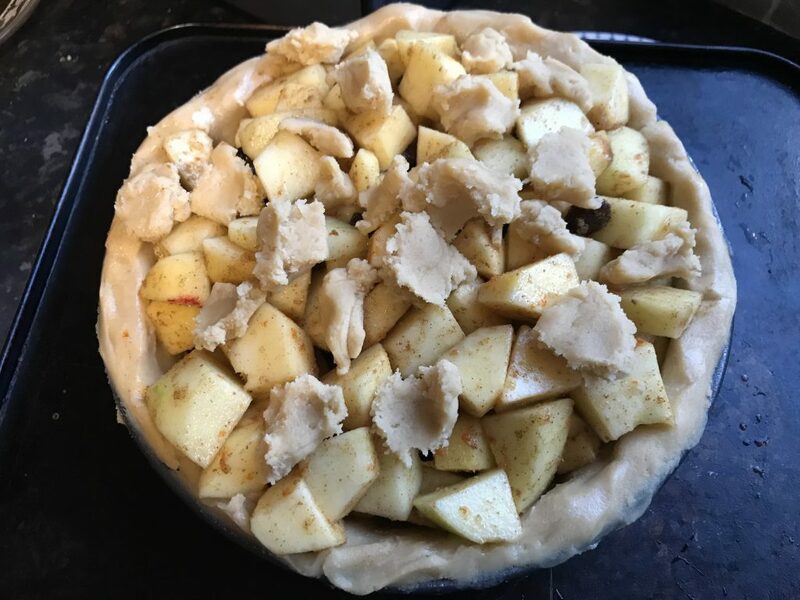 Turn the oven down to 170c and continue to bake until the apples are soft and the crust is crisp – about 1 1/4 hours cooking in total but it may be longer. You may need to cover the tart with foil to prevent the pastry from burning. Cool for several hours before slicing – you can turn it out onto a wire rack but I kept mine in the tin. Serve in generous wedges with whipped cream. Keep any leftovers in the fridge. 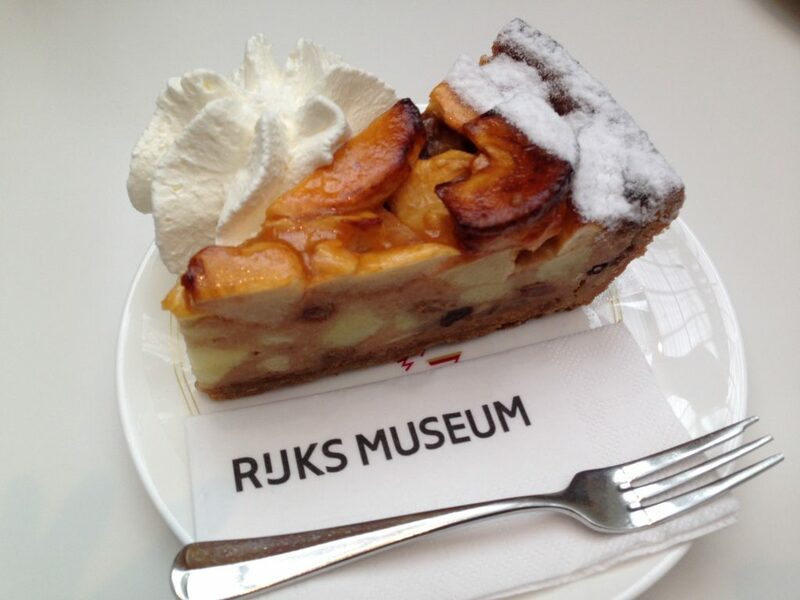 This entry was posted in Recipes, Sweet and tagged amsterdam, appeltaart, apple pie, deep dish pie, Dutch apple pie, rijks museum, whipped cream. Bookmark the permalink.